Imagine a Ford Focus RS and its EcoBoost turbo 2.3-liter inline-four, and then tear away the rest of the car and pop the motor in a super lightweight racing convertible that’s barely street legal in Europe. That’s the Dallara Stradale, the first street-legal, asterisk asterisk, car from Dallara, the company that’s most notable for manufacturing racing chassis for a bunch of racing series. Well, they wanted to make a track day toy that could be driven on the street between the house and circuit, so they built the Stradale—a 155,000 Euro (roughly $177,525), 400 horsepower, 1,885 lb convertible that doesn’t have a roof nor any dang doors, you just hop in the sucker. 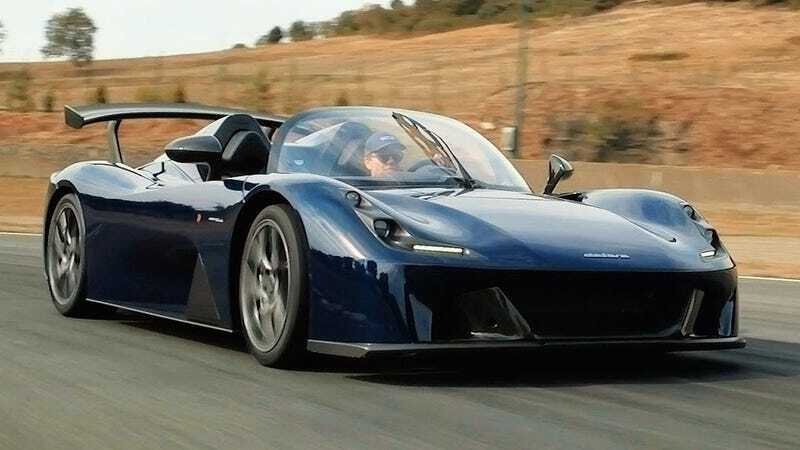 As pointed out in the video, the Dallara Stradale can be had in a dual-clutch that’s awkward at lower speeds but ace at high speeds, or a manual, which is for those that aren’t practicing for their Formula 3 team all the time. The turbo Ford engine sort of spoils the experience a bit, with some whistling and a less-than-stellar exhaust note. Considering the super light weight and small engine, the Stradale is still a lot of car, the type of thing only a racing driver could get a full appreciation for. Sounds exclusive, if just a little silly. Does It Have Drift Mode?